We have had numerous requests for concrete mix ratios by weight, by volume, and by mass. 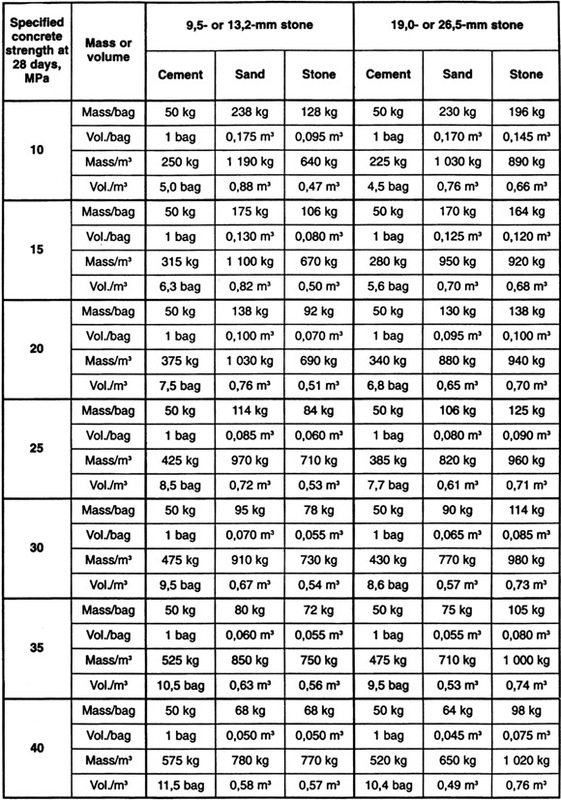 Here is a table that was released by the Cement and Concrete Institute for trial concrete mixes from 10MPa to 40MPa. These are trial mixes and should be used to test your concrete before it is used in any construction work. Your “competent person” or project manager should always assess and approve any concrete work undertaken on your site. The mix proportions in the table are by mass and volume, using different size stone, for different strengths of concrete. You must add water to the mixture until it becomes workable; you can judge this by eye. The difference between various cements and aggregates is not taken into account with these mixes. Make sure that the water is kept together with the mix and is not allowed to drain/run away as this could result in a weaker mix. These proportions are based on the assumption that a CEM type cement of strength class 32,5 will be used. Cement of strength class 42,5 or higher will give a stronger concrete but may be less economical. Cements with high extender contents (eg CEM 11/B or CEM 11) will develop strength more slowly and will require particular care with curing. Masonry cements complying with SABS ENV 413-1 should only be used with specialist advice. A mix made according to this table, and to the required consistence, should be assessed for workability and stone content before being used on a large scale. 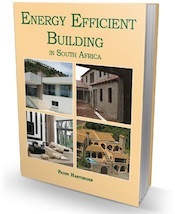 Quantities of materials per cubic metre of concrete are net. 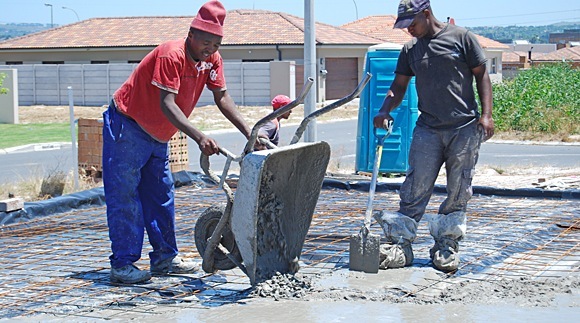 Allow for wastage when ordering – for instance 3% on cement and 10% on aggregates. Below is the nominal mix proportions (also referred to as the ratios of mixes) for different strength categories, using a 19mm stone. NB. Low would be average 15MPa, medium 25MPa and high 35MPa. This is a guide only and quantities must be adjusted for the final requirements and specified by a “competent person“. How can site concrete mix design be made more reliable, even against readymix concrete from batching plant? Hi Menas, The only way on site is to make a batch box and monitor the people doing the mixing closely. The other factor that come into the calculation is the stone size and the dampness of the sand. So the mixing becomes an imprecise science. If you are worried it might be better to use a ready mix where you have some recourse if anything should fail. Hi Hari, 1cc of water = 1 gram so 1 Liter will = 1 Kg = cu vol 100mmx100mmx100mm = 1000cc. Find out what the volume is first then you will have the weight. What strength of concrete do I need to threw for a slab to be used as parking for motor vehicles, small truck up to 4 tons and forklifts with a capacity of 5 tons. Slab will also be used as a loading bay. We have a very inexpensive handbook that will give you all the info you need about concrete and mortar. I am throwing a slab with a required strength of 25 MPA. The area is 16m² at a required thickness of 75mm, which calculates to 1.2 m³ of concrete. The above tables only gives me the ratio mix for 1m³, and I am required to have slightly more. How much more cement, sand & stone will I require to complete the job satisfactorily? I will be using the 19mm stone. Would it be safe to use say 9 bags of cement to 1m³ sand and 1m³ of stone? I will be grateful if you could assist me with this calculation. Many thanks for the helpful website. Hi Laurence, Ideally to get your 1.2³ m the number of bags will be .841³m with .84³m each sand and stone in theory. It is best to always mix a little extra as there will always be shrinkage and some waste. So your ratio of 9 bags to 1³m sand and 1³m stone will fine be for the strength and quantity you need. Many thanks for your help and advice. It is really appreciated. I’ll give it a bash and see how we do. This is a very helpful website. Thanks again. Hi Roger, You will need 75sq m X .1 = 7.5 cubic meters of concrete. The tables on this page “concrete-mixes-by-weight” will give you the amounts that you will need. Thank you,but how can i reduce the amount of the materials so that it can enter or contain in a 56 litres mixer.